Journigan’s Mill was built in the 1930’s at a site in Emigrant Canyon that was near several springs. 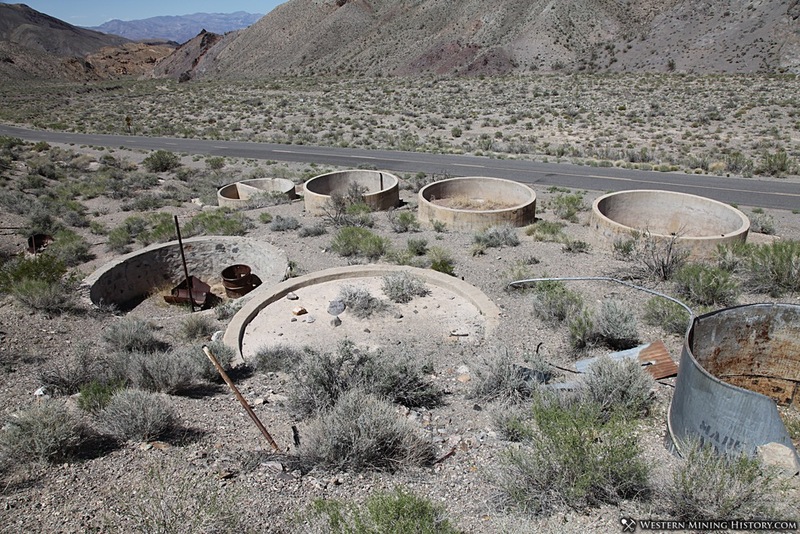 Water is Death Valley’s most precious resource, and mills were usually located where there was access to springs nearby. During the course of the mills roughly twenty years of operation, water would be piped to the site from up to four different springs. The site of Journigan’s Mill was previously used by at least one and possibly two mills prior to Journigan’s operation. 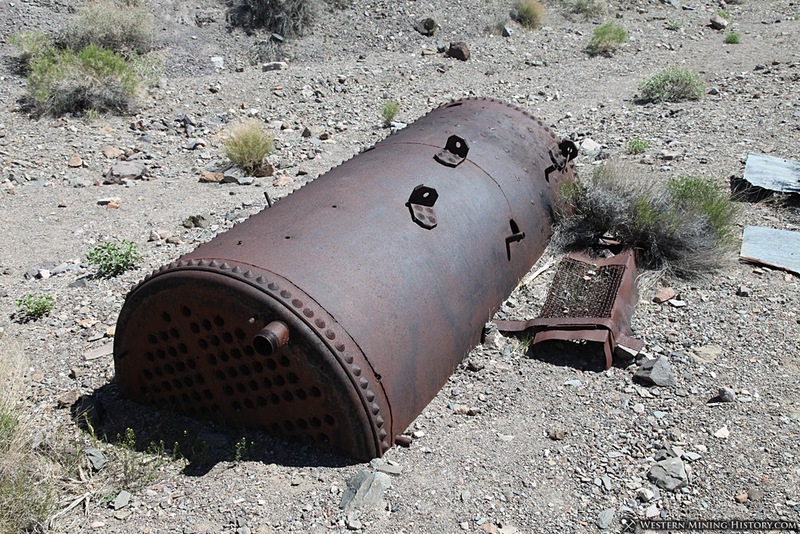 There are also mill remains just down the road at the site of Emigrant Springs, a former mining camp. While at least four mills operated in this area, Journigan’s mill was the largest and longest running mill in the area. 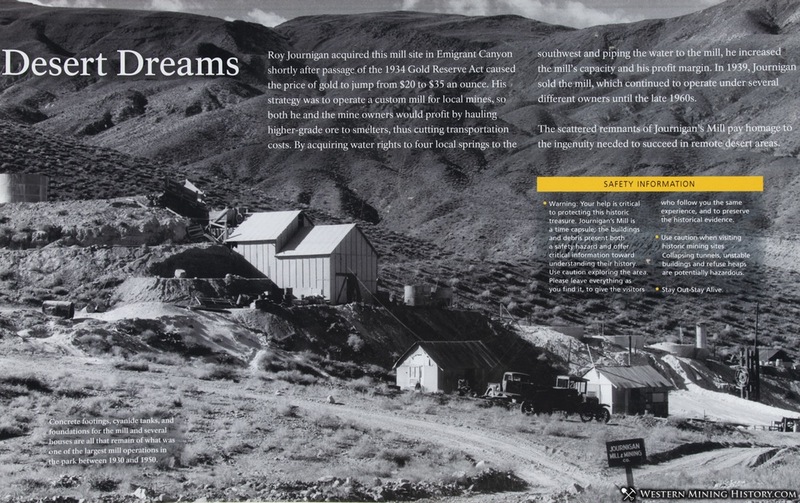 Roy Journigan acquired this mill site in Emigrant Canyon shortly after the passage of the 1934 Gold Reserve Act caused the price of gold to jump from $20 to $35 and ounce. His strategy was to operate a custom mill for local mines, so both he and the mine owners would profit by hauling higher-grade ore to smelters, thus cutting transportation costs. By acquiring water rights to four local springs to the southwest and piping the water to the mill, he increased the mill’s capacity and his profit margins. In 1939, Journigan sold the mill which continued to operate under several different owners until the late 1960s. Machinery at the plant consisted now of a twenty-five-ton ore bin, a 6 in. by 8 in. Blake crusher, a twenty-five-ton fire ore bin, a 3 x 4 ft. Straub cone-type ball mill, seven 14 x 5-ft. cyanide tanks, 4 x 8-foot amalgamation plates, and four-compartment zinc boxes, the entire operation being powered by a fifteen h.p. Fairbanks-Morse gasoline engine. Four men were employed working ore from the Skidoo mine and performing custom work for other mines in the area. The plant’s capacity was twenty-five tons per day. 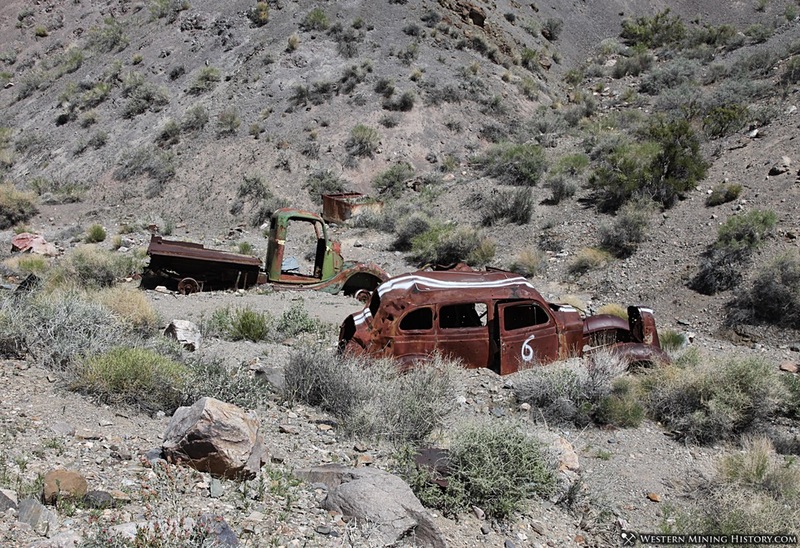 In September of 1959 the machinery at Journigan’s Mill was purchased by the Argentum Mining Company and was dismantled and moved to Columbia Flats, Nevada, southwest of Mina. 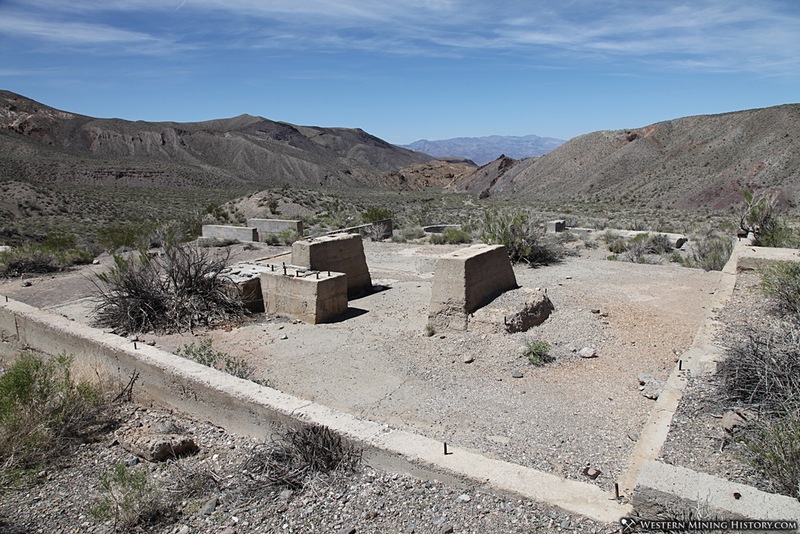 The remains of Journigan’s Mill are located on Emigrant Canyon Road in Death Valley National Park. 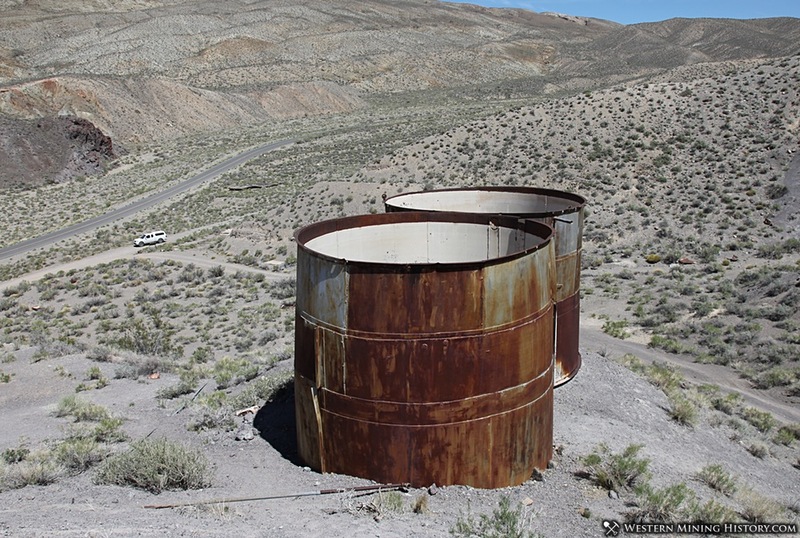 The mill site is located right on the side of the road and consists of concrete foundations and two steel water tanks. While not much is left of the mill, it is a quick and easy stop to make and is worth taking a look at for anyone interested in mining history.